Bootfitter’s comments: A new backcountry boot built on the best-selling Hawx Ultra chassis, the Hawx Ultra XTD offers awesome skiing power and range of walking motion in a lightweight, versatile package. The narrow last and Memory Fit shell give a precise, responsive fit. 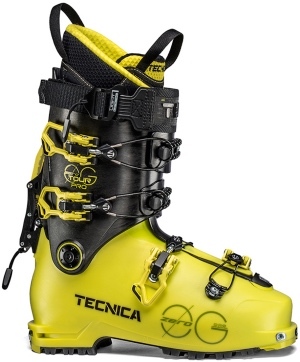 Bootfitter’s comments: A brand new boot from Tecnica, the ZeroG Pro Tour builds on the success of the hugely popular ZeroG range of the last couple of years, but offers a new last shape, slop-free walk mechanism, and a lighter weight construction for improved uphill performance. Brand new from Scarpa this year, the Maestrale RS2 replaces the original Maestrale RS, claimed by Scarpa to be the bestselling touring boot in the world. The RS2 retains the same medium-volume last as the old model, but in a stiffer, lighter package which offers a superior range of walking motion. Bootfitter’s comments: In the ever-expanding backcountry sector, gear that is light, easy to use, and that performs as well on the way down as the way up is the holy grail, and Scarpa seem to have nailed it with the Maestrale RS2. A super versatile boot for high-performance touring! An update on the ultra-popular and versatile Maestrale, the Maestrale 2 is lighter than it’s predecessor, and features a new walk mode borrowed from Scarpa’s Alien ski mountaineering boot. Offering a massive 60 degree range of motion, the Maestrale 2 will again bridge the gap between intuitive, comfortable hiking and downhill performance. Bootfitter’s comments: Featuring a medium-volume fit, customisable liners, a sporty 100 flex and a superb walk mode, the Maestrale 2 should pick up from its’ predecessor as a bestselling backcountry boots, particularly amongst strong alpine skiers looking for a first dedicated backcountry boot. A ski touring boot geared more for the climb or for the descent? As of Winter 2018-19, this basic ski touring question will finally be a thing of the past because the Hoji touring boot has turned the question of “either-or” into simply “and.” Thanks to the patented Hoji-Lock System, you get a direct connection between upper and shell -- the flex between the two elements now is a thing of the past. The result is downhill performance just like you get with an alpine ski boot. Bootfitter's comments: A radical new design from Dynafit, the Hoji Pro Tour is a dedicated backcountry boot which gives nothing away in terms of downhill performance. The unique walk mode mechanism gives great range of motion while touring, and a rock-solid connection when locked in ski mode for maximum power transfer and response.